A tale of two mountains – Mt Hood, and Mt. Adams. Wy’east and Klickitat. The mountains of Eastern Oregon/Washington are beautiful; giant peaks that seem to scrape the sky, rising up high above the land around them. When I first moved to Hood River, I was continually reminded of The Hobbit and the Lonely Mountain, since Mt. Hood seems to soar alone along the horizon. We’d been stuck in Portland for a while, and feeling pretty antsy to get moving and exploring. While Sarah’s leg wasn’t quite up to a full hike along the mountain, and I wasn’t up for a summit attempt, we were feeling like visiting the mountains in some manner. Our plan – drive out to the base of both, and visit Hood River to let Ollie run around her old stomping grounds as a rest between the two. I’m happy to report that the plan went off without a hitch! Our drive to Mt. Adams was a bit rockier than planned, but the rest of the adventure went beautifully! The challenge with Adams was that we’d forgotten about a big forest fire that’d happened a few years back, and had closed off some of the roads around the base of the mountain. Specifically, the road that we’d planned on taking up to a pretty lake above the foothills of the mountain… we drove up it, but then (not literally, thankfully) ran into a literal wall of construction equipment blocking the trail. Turns out that they’re re-building the road after the fire, and don’t want people driving up through their work area. So, to make sure people don’t sneak in, they simply parked their massive bulldozers as a barricade, and called it a day. So… we didn’t make it to the lake. But we did get some amazing views, a chance to run around, and a very enjoyable stop out of the whole event. I’ll call that a win. From Mt. Adams, we headed South to a little town that we haven’t visited in a very long time… Hood River! Our goal with Hood River wasn’t the town itself though – instead, we were going for our lovely little monster, Ollie. When we lived in Hood River, her favorite place in the world was The Spit, where she could run and swim and jump and splash and chase dogs and chase birds and sniff and run and play forever and ever. 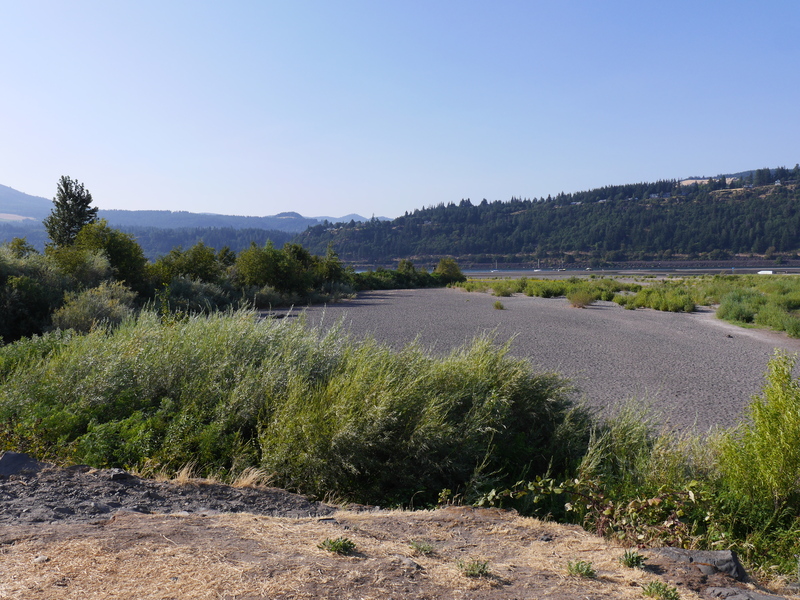 Since we needed to take the Hood River bridge, which is right next to the spit… it would have been mean not to go, right? We went. We walked, Sarah tried walking on different surfaces (Sand is pleasant, pebbles weren’t so much so), and we enjoyed being nostalgic about the summer nights and winter days that we’d spent exploring the spit, way back when. With our walking done, and Ollie’s tweaking out needs satisfied for the time being, we continued on our adventure, heading southbound toward Adam’s companion mountain, Mt. Hood. Our goal wasn’t anything super intense or special; we were going to one of the sno-parks, with the goal of playing in the glacial runoff and enjoying the views. We… uhh… may have been a little loopy from the car ride, the lack of food, and the time we’d spent in the sun while walking on the spit. I admit to nothing; we were having fun, and that’s what counts!